As summer approaches and outdoor cafes fill up, one ingredient you’ll see popping up on menus all over is matcha. It comes in many forms, from hot and cold matcha drinks to matcha-infused pancakes, cookies or muffins. This edible tea powder, originally from Japan, is now found in tea bowls and kitchens the world over. Matcha is a ground green tea powder made from leaves of a shade-grown Camellia sinensis plant. Serving matcha as tea involves adding hot water to the powder and then whisking until the tea is blended and frothy. Historically, matcha has been part of centuries old Zen-Buddhist traditions, it was consumed by the samurai before battle and is the focal point of Japanese tea ceremonies. The tea ceremony alone is over 1000 years old and it focuses not only consuming tea but in dedicating one’s entire self to the preparation and aesthetics of the tea and utensils; resulting in a meditative and ritualistic process for both host and guest. From these historical roots in Japan, matcha has become a versatile ingredient now used to make a wide assortment of beverages, including cocktails, and is used as an ingredient in many food recipes. To satisfy the many uses of matcha the powder is available in several different grades, generally listed as ceremony, classic, café, and kitchen grade. Each one has undergone varying degrees of processing and comes with a unique flavour profile – and of course, price. There are lots of brands, grades, and recipes to experiment with but no matter which way you consume matcha you will surely hear about the many purported benefits of this “superfood”. Most often, matcha is said to be a natural mood enhancer and relaxation aid. However, many websites boast health benefits such as anti-oxidative properties, the lowering of cholesterol and blood sugar, the boosting of metabolism, the detoxification of the body and the prevention of disease. Unfortunately, like many health trends, a lot of fiction gets mixed with fact – detoxifying, for example, is a known myth circulated in the health and wellness community. But what about some of the other matcha claims? A study in 2017 reviewed 49 human intervention studies and summarized the findings concerning the effects of green tea on mental clarity, cognitive function, physical activation and relaxation. The reviewed studies investigated three common constituents of green tea that are said to provide these benefits: caffeine, L-theanine, and epigallocatechin gallate (EGCG). The review found that caffeine improved self-reported alertness, arousal and vigor plus performance on long, demanding cognitive tasks. L-theanine on its own improved self-reported relaxation, tension, and calmness, and when combined with caffeine had a small effect on performance in attention-switching tasks and alertness. The evidence for any claims on EGCG however could not be validated. Another common proclamation is that matcha prevents disease, and this too appears to be rooted in fact. Two studies, one in 2014 found some catechins in green tea have antimicrobial properties against several species of bacteria, and a second from 2017 found specific defensive properties against Fusobacterium nucleatum – a bacteria implicated in destructive periodontitis (gum infection) and inflammatory bowel disease. One of the most commonly repeated benefits of matcha is “metabolism boosting” that can lead to weight loss. Many weight loss products contain matcha extracts and claim metabolism boosting properties. However, in 2015 NPR published an article investigating the science behind these claims and came up with very little hard evidence. Their reporting found one study from the Netherlands showing a small and perhaps fleeting weight loss effect. A meta-analysis from 2012 summarizing the available studies on matcha and weight loss concluded there was a small, statistically insignificant reduction in weight among overweight or obese individuals. There was no effect, however, on sustained weight loss. 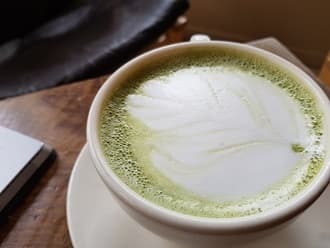 Like many food health trends, matcha tends to come with a mixed bag of fact and myth, making it important for consumers to be careful when assessing health claims—admittedly difficult in the age of the internet and social media. Matcha may not be a miracle super food but it does have some health benefit and is a versatile ingredient, rich in beautiful traditions. So one recipe for enjoying this new food trend is a dash of skepticism and a pinch of research; these will help you sort fact from fiction without taking away from your enjoyment of the food’s most attractive property – the taste!